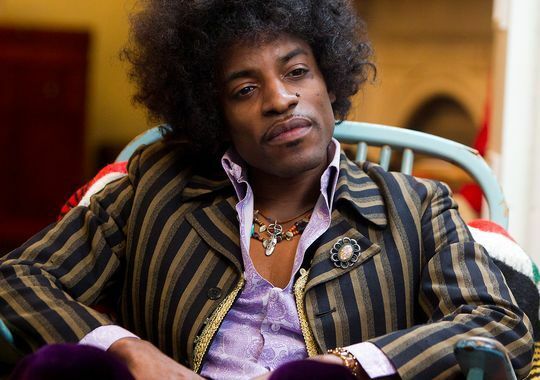 I am stoked to see Andre Benjamin (aka Andre 3000) as Jimi Hendrix in the biopic All Is by My Side. The Outkast frontman has the musical chops and (more importantly) the cool to pull off Hendrix, but unfortunately we will not get to see the full Hendrix experience. Experience Hendrix LLC, the stewards of the Hendrix estate, issued a statement last month that declared no film could use the Hendrix catalog without full participation from Experience Hendrix LLC. Writer/director John Ridley found a workaround by setting the story in London 1966-1967, shortly before the release of Hendrix’s debut album, Are You Experienced. Instead, Benjamin will cover The Beatles, Muddy Waters, and more in All Is by My Side. Hit the jump for a list of the songs and a few new set photos. “Sgt. Pepper’s Lonely Hearts Club Band,” which Hendrix famously performed in a London club while Paul McCartney and George Harrison were in the audience. So long as we get to see Benjamin try out his Hendrix impersonation, the distance from the Hendrix classics should serve as a buffer from sharper criticism of mimicry. And in lieu of authentic Hendrix, The Beatles and blues standards are a wonderful substitute. Hayley Atwell and Imogen Poots star alongside Benjamin in All Is by My Side. Production is expected to wrap soon in Dublin, Ireland. The producers want to take the film to Sundance next year with a possible release later in 2013. Caught on Set has a few new set photos.